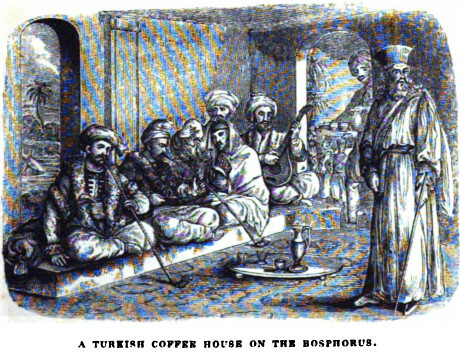 A late 19th century coffee house in Tophane, Istanbul. Wikimedia Commons/Mergerdich Jivanian. Public domain. The current protests in Turkey are sparked by the increasingly authoritarian measures by the AKP government and its prime minister Tayip Erdogan. Part of it is the perceived creeping Islamisation of public life, notably the measures to prohibit the sale and serving of alcoholic drinks between 10 pm and 6am, effectively restricting night life and entertainment, which will hit hardest in Istanbul’s Beyoglu and similar districts of bars, restaurants and music venues. This is seen as an assault on the life style of many Istanbulus, especially the young. This reminds us of the iconic significance of alcohol in socio-cultural and ideological boundaries throughout Muslim history, and especially in Turkey since the nineteenth century reforms. 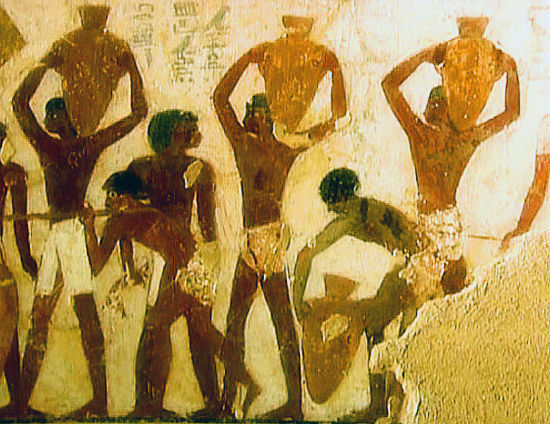 Transport of wine in Egypt. Wikimedia Commons/Unknown. Public Domain. It is interesting to note that the context of this prohibition is one of social order, as distinct from the verses elsewhere which prohibit pork, blood and carrion in the context of purity and pollution. This social order focus has a significance for later permissive interpretations which considered that it only applies to ‘rough’ common people who are out of control and cause trouble, and not for refined elites. 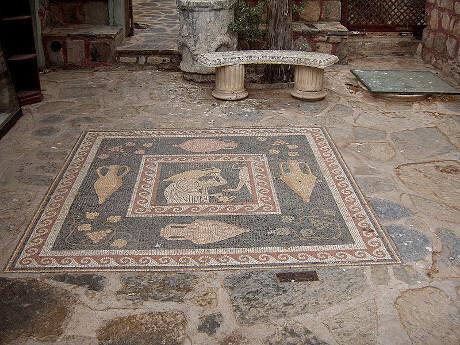 Modern floor mosaic with amphoras. St. Peter’s Castle, Bodrum, Turkey. Wikimedia Commons/Georges Jansoone. Some rights reserved. The explicit prohibition of alcohol in Islam as well as the common breach of this prohibition in so many social contexts, historically and at present, has made for a potent theme in moral and cultural discourse. Many Muslims flouted the prohibition, some with a trust in God’s mercy towards faithful sinners, others with explicit rationalisations, commonly the view that the prohibition is a matter of social order against the drunkenness of common and ignorant people (al-`awam), and should not apply to the refined elite (al-kahssa). The tension between commandment and practice, however, offered a fertile theme for poetry, narrative, mysticism and humour. Classical belles lettres narratives and essays feature tales and humour about drink. A notable genre of poetry is labelled khamriyat, wine literature, including prominent names in the literary canon, notably the Abbasid poet Abu Nuwas (756-814) among many others throughout history and till now. Books on medicine contained chapters on wine, considered favourable to digestion and balance of the humours. Alcohol and the imagery of intoxication are common elements in the lore of Sufi mysticism. While some apologists have argued that this is a purely literary device or a spiritual analogy, not referring to real practice, we do know that many of the mystics and some tariqas (Sufi orders), notably the Bektashi order in Turkey and the Balkans, used alcohol as part of their ceremony. The majority of Sufis, however, frowned on the practice and denounced it. Much of popular as well as literary humour revolves around tales of the hypocrisy of pious people, including clerics, with regard to drink and intoxication. In short, the lore of alcohol is a potent element in diverse cultural fields in Middle Eastern history and society. 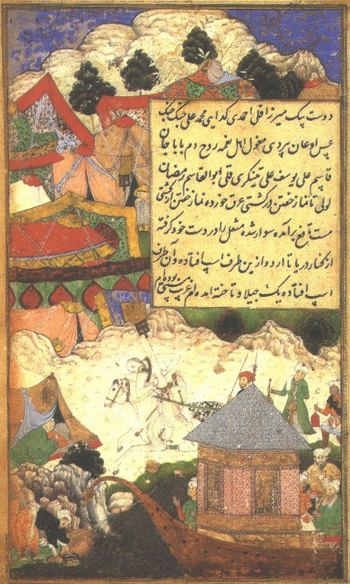 A drunken emperor Babur (1483-1530) returns to camp at night. Wikimedia Commons/Painters of Babur. Public domain. The courts and the elites cultivated cultures of drink over the successive Muslim dynasties. The Abbasid caliphs, at the perceived golden age of Islamic civilization, included prominent drinkers, and the said Abu Nuwas was a favourite in the court of Harun al-Rashid (r.786-809), at the peak of that dynasty. The manuals of ‘Mirrors for Princes’, a genre of Machiavelli-style advise to princes, included sections on the etiquette (adab) of drinking parties and entertainments. Many, reportedly, drank to excess, in continuous parties over many days. The emperor Babur (1483-1530), the conqueror of India and the first Mughal ruler, wrote an autobiography, the Baburnama, in which he is candid about his dual vices of drink and love of boys, which he strived to control in bouts of piety. Literary narratives and diaries tell of the drinking parties of notables and men of state, including Qadis (judges) and doctors of law. The picaresque tales by essayists relate episodes that feature drink as a common indulgence in taverns and markets for ordinary urban people. Soldiers and tough guys of the urban landscapes had their favoured taverns. Drinking, however, always proceeded in the shadow of official censure if not prohibition. Authorities would occasionally crack down on drinking and taverns with arbitrary punishments. These were often gestures in periods of political contests over piety, or measures to ensure control over social spaces. One such period was the reign of the stern Ottoman Sultan Murat IV (r. 1623-1640) who prohibited alcohol, coffee and tobacco, sanctioned by severe penalties, including death. He was also known to be a heavy drinker, and his early death is attributed by some historians to liver disease. It is related that this ruler wandered the streets of Constantinople in disguise to check for himself that his edicts are obeyed. On one such expedition, it is told, he took a boat ride across the Bosporus, and noticed that the boatman was drinking from a bottle. Suspicious, he asks to taste the liquid: finding it was wine he admonishes the man for disobeying the edicts, at which the boatman demands: who do you think you are? At the Sultan’s reply, the man mockingly retorts: ‘one draught and you think you are the sultan!’. Turkish coffee house on the Bosphorus. Wikimedia Commons/Edmund Spenser. Public domain. The story of Murat IV illustrates an important general point, still relevant today: prohibitions of alcohol are as much to do with social control as piety and observance. Murat, we note, also banned coffee and tobacco: this was part of a general religious and political campaign against the then emergent coffee house in which these items were enjoyed. In the early days of the coffee house many scholars ruled that coffee was an intoxicant akin to wine. These venues constituted spaces of sociability, mixing and entertainment outside the control of authority, much like taverns. We have a literary portrayal of this phenomenon in Orhan Pamuk’s My Name is Red, of the coffee house harbouring poets, entertainers and story tellers, considered subversive by a local fundamentalist imam, who ultimately leads his flock on an attack to destroy the café. 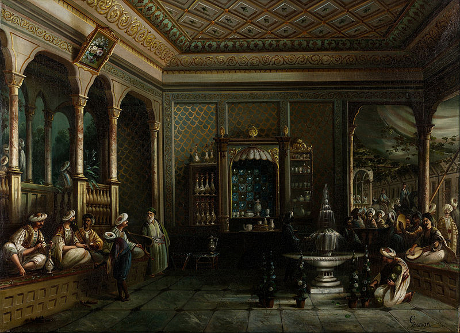 Cafes continued to be venues of free sociability and, later, political discourse, distrusted by the authorities: Sultan Abdul-Hamid II (r. 1876-1909), the last authoritarian Ottoman ruler, was famous for his network of spies, many of them reporting from cafes. Prime Minister Erdogan responded to protests of his edict to limit the hours of permissible dispensing of alcohol by advising his critics to drink at home. Public space is to be saved from alcohol accompanying sociability. 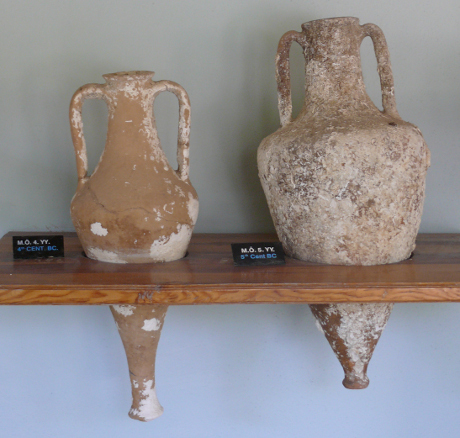 Thasian amphora, kept at Bodrum castle (Turkey). Wikimedia Commons/Ad Meskens. Some rights reserved. Christians and Jews play a special part in drinking lore over the ages. In many Muslim polities these minorities were licensed or tolerated to produce and sell alcohol. Consumers included Muslims, who were, in turn, often (but not always) interdicted from production and distribution. Istanbul meyhanas, taverns/restaurants, in modern times were predominantly owned and run by Greeks and Armenians, until the departure of most of these populations in waves over the course of the twentieth century. 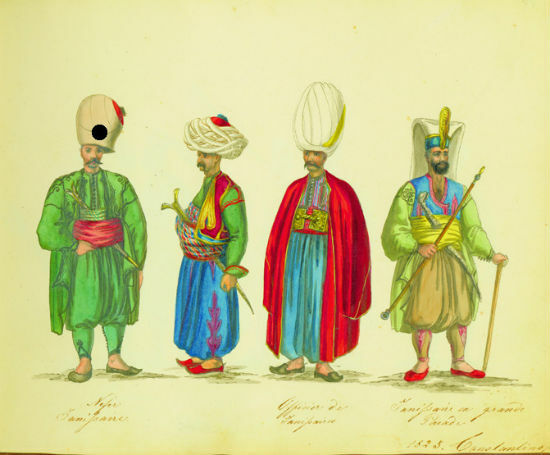 Janissary officers. Wikimedia Commons/Chevalier Auguste de Henikstein. Public domain. Soldiers and urban toughs featured prominently in the lore of drink and taverns. 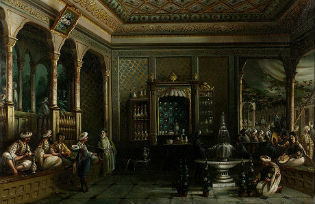 In Ottoman lands, especially Turkish cities, the Janissary military corps were notable drinkers, with their own dedicated taverns, featuring entertainments such as dancing boys. The Janissaries were also devotees of the Bektashi Sufi order, considered heretical by Orthodox Muslims, and which featured drink as part of its rituals. In their period of decadence in the eighteenth and early nineteenth century their acts of violence and extortion, as well as riots and rebellions were fuelled by drink. They were instrumental in overthrowing Sultan Selim III (in 1808), who had tried to control them, but were outmanoeuvred by his successor Mahmud II who succeeded in abolishing the Janissaries in a famous massacre in 1826, in favour of a modern army. The abolition of the Janissaries dissociated the image of alcohol from the rough and violent soldiery and facilitated its emerging function as an element of secular modernity. 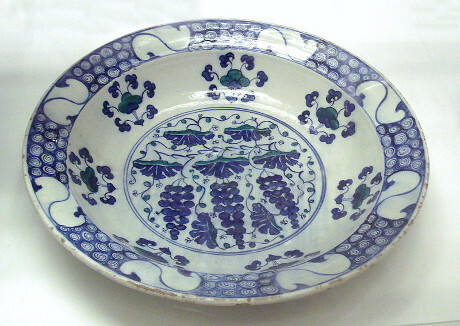 Fritware dish from Iznik, Turkey, (1550-70). Wikimedia Commons. Some rights reserved. The Ottoman reforms over the nineteenth century transformed government, law, education and the economy, modernising these institutions along European lines, partly in response to the contingencies of incorporation the region into world capitalism. New classes developed: the personnel of state institutions, modern education, the professions, the media, the arts and the new military, as well as new working classes in railways, ports and other urban sectors. These were the bearers of socio-cultural transformations and an outlook and desire for being modern and ‘civilised’, medeniyet. Drink and drinking cultures became part of this modernity and civilisation. This culture was at odds with the deep layers of conservative Turkey and other Muslim parts of the Empire, the start of the cultural conflict that was to mutate and transform till recent times. The new middle classes and elites, including the Court and the state class, drank, not just for the love of alcohol but as a life style statement. François Georgeon, a French historian of the period, wrote a fascinating account of the symbolic significance of alcohol for notions of modernity and civilization in Turkey from the nineteenth century[ii]. Sultan Mahmud II (r. 1808–39) was the first reforming ruler who made a serious impact. He modelled himself on other European rulers, and included alcohol as a feature of public occasions such as official dinners and receptions. Champagne, which was not new to the Ottoman court, then came out in public. Later in the century, the state class of the expanded reform bureaucracy became the vanguard of the drinking classes. To cater for them, a new type of refined and opulent tavern or meyhanecame into existence, with a professional guild of tavern keepers and their assistants trained in the arts of serving drink and its accompaniment of mezze, and in the skills of nursing a narguila(water pipe). Among the consumers, a new adab– etiquette and lore of drink – determined a kind of savoir boire. Much of this new culture of drinking revolved around the newly fashionable rakı/arak, displacing the earlier wine and boza, a drink of fermented grain. It became an identity marker as a specifically native drink, in contrast to the more cosmopolitan and European wine. It acquired the honorific description of arslan sutu (lion’s milk), and in Arabic (at least in Iraq) of halib sba` with the same meaning. Erdogan’s proclamation in a recent polemic that the Turkish national drink is Ayran (yoghurt drink) and not rakı was a statement in this culture war. Alcohol became an issue during the rule of the authoritarian sultan Abdul-Hamid II (1876-1909), who propagated Sunni Islam as and ideological buffer of the dwindling Empire. But the propaganda against drink remained just that, moral and medical, but did not impose prohibitions and the culture of drink persisted. The Young Turks who deposed the Sultan in 1909 were socially liberal and largely secular. 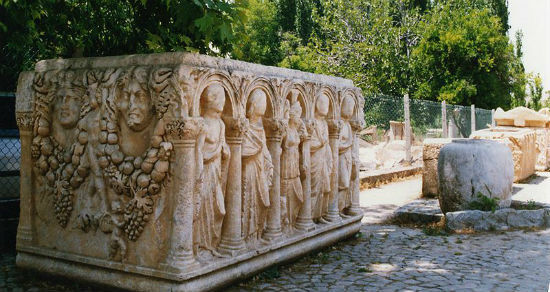 Sarcophagus in Aphrodisias, Turkey. Wikimedia Commons/Luigi Chiesa. Some rights reserved. The Turkish Republic established by Ataturk in 1923 and abolished the Caliphate in 1924, a deeply symbolic measure, involving the secularisation of the state and the law, and the abolition of Shari`a courts. Henceforth the separation of religion from politics and the secularity of the state was to be a pillar of the Republican constitution. Religious orders, tariqat or jamat were prohibited and driven underground, and official religion brought under the control of state institutions. Religious opposition to these measures was heavily repressed, and henceforth the deeply conservative and religious sectors of the population pursued their piety in private: the clash of cultures was masked. In succeeding decades and into the 1990s, the army appointed itself as the guardian of the Kemalist constitution and the secularity of the state, and to that end staged successive coups against what it deemed to be departures from those principles. Islamic political parties surfaced from the 1970s, contesting parliamentary elections, with sufficient success to enter into government coalitions, but always checked by the Kemalist establishment, especially the army. Drink was an important component of the secular culture of the Republic and the modern elites and bourgeoisie associated with it. Ataturk and his theorists were emphatic in separating Turkey from the Ottoman past and the Perso-Arab ‘Oriental’associations. They recovered a supposed pre-Islamic Turkic culture (much like some Iranian and Egyptian counterparts) which was more akin to modern European tropes: not only liberated women in public affairs, but also music, art and life styles. Ataturk and his associates held state balls, dressed in tuxedos with tales and female ball gowns, and danced tangos and waltzes: it was compulsory to bring wives. Drink was part of these cultural styles, in continuity with earlier Ottoman modernity. Ataturk was a notable drinker, fond of his raki. Devotees of the great man were seen until recent times at the bar of Sirkeci rail station saluting his memory with the national drink accompanied by his favourite simple (white) mezze of white cheese, melon and cacik (yoghurt/cucumber). Erdogan in his recent defence of the strictures on alcohol denounced a law ‘made by two drunkards’ as against his stance which supposedly followed basic national values. 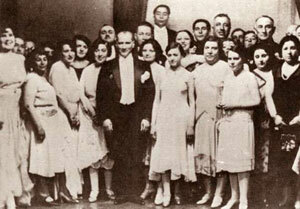 Atatürk at the New Year’s ball in 1929. Wikimedia Commons/Hariciye Köşkü. Public domain. The Beyoglu district of Istanbul is the centre of arts, entertainment, bars, clubs and restaurants. It comprises the historical European and cosmopolitan parts of the city, Galata and Pera. It also contains Taksim Square and Gezi Park. Drink and music are essential items in its mix. For many Istanbulus it has symbolic and historical significance of continuity with the city’s cosmopolitan past and the diversity of its cultures. Over the course of the twentieth century many conservative and even religious Turks accepted these aspects of Istanbul as part of their history and diversity. Indeed many such Muslims saw no contradiction between their religion and a nationalist pride in the Republic, sharing in the adulation of Ataturk, including the secular constitution. The resentment against this urban culture came with political Islam and its parties, starting in the 1980s, carried, in part, by the swelling of Istanbul’s population by migrations from rural and provincial Anatolia, altering the character of the city. The Istanbul bourgeoisie saw this as an invasion and a threat, the barbarians at the gate. This demographic transformation was translated into Islamic success in the municipal elections of 1994 when Erdogan was elected mayor of the city, and the mayor of Beyoglu was also from the then pro-Islamic Welfare Party. Beyoglu had its own shantytown area, and many of those who enjoyed its facilities did not live there. Sure enough, the first target of the new mayor was alcohol: he demanded that drinking should not be visible to the public, that bars should not have outside tables and should install curtains to hide their interiors. Outrage on the part of Istanbulus brought protest and defiance with demonstrations of public drinking. The orders were soon withdrawn. At that point the secular citizens were ascendant, with backing from the media and the public, and the Islamists had to watch their back with fear of military intervention. Now, after a decade of electoral success and economic growth, governing without a coalition, the army neutralised, in control of the media, the judiciary and the police, Erdogan feels free to move on this crucial symbolic issue of alcohol and its venues. The social and electoral base of the AKP comprise the new provincial bourgeoisie from the Anatolian cities, whose businesses have thrived since the 1980s but more so under AKP rule and the economic renaissance accompanying neo-liberal regimes. The AKP also has much support among sectors of the working class and the poor who benefit from its social assistance policies and the rise in employment and wages. Erdogan’s conservative and moralistic edicts and proclamations echo the cultural aspirations and resentments of these constituencies, especially the Anatolian bourgeoisie. Moral disciplines, ‘family values’, religious education and cultural conformity go down well with this constituency, and Erdogan is delivering. Control of alcohol and banishing drink from public space is emblematic within this outlook. A central issue for the Gezi Park and Taksim protesters is that of the unrestrained building and development boom in Istanbul, razing old neighbourhoods for gated housing and shopping malls. The beneficiaries are cronies of the AKP, given access to public land and development permits. Private developments and shopping malls privatise public space and public assets. Like restricting and hiding alcohol and its associated sociability, this is part of the process of controlling, restricting and moralising public space. Erdogan responded to protesters by telling them to drink at home. 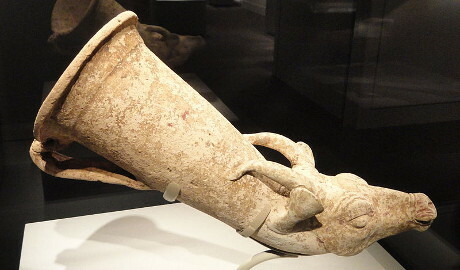 Wine horn from Iran or present-day Turkey at the Arthur M. Sackler Gallery. Wikimedia Commons/Daderot. Some rights reserved.